By: Andrea Spacht, Sustainable Food Systems Specialist, Healthy People & Thriving Communities Program. Blog Post reprinted with permission from NRDC. Meal prepping was the only way I could get through night classes while working full time. On Sunday afternoon, I would make 5 servings of 2 recipes (one for lunch and the other for dinner) and split it out in containers for each day. 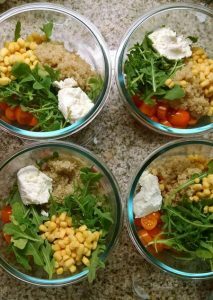 By cooking one big recipe that covered several meals over the course of the week, I was able to save time, still eat healthy, and not break the bank. But sometimes I wasted a lot of food and money, too. I filled my containers to the brim. Or I would have too much of an ingredient left over that I didn’t know what to do with. Often, by Thursday I was so tired of what I had prepared that I wouldn’t finish the rest of the meals. 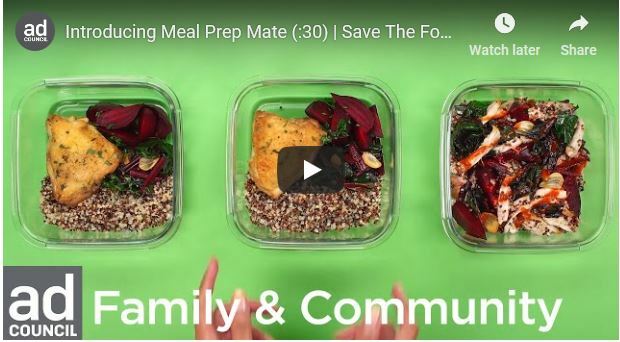 Save The Food’s latest tool, Meal Prep Mate helps users overcome these common food wasting barriers. And in the process, they not only eat healthy, and save time but save food, save money and help the environment in the process. By now, most of us are familiar with the alarming statistic that up to 40 percent of the food in the US goes to waste. Perhaps less well-known, about 40 percent of that waste happens in our homes. And if you start to dig in to some of the reasons why food is wasted in other parts of the supply chain (cauliflowers that are too yellow, restaurant portions that are too big, etc.) consumer behaviors and preferences are responsible for an enormous amount of wasted food. Most household food saving strategies revolve around better planning and adequate portioning. A lot of people are also thinking about these concepts with the popular trend of meal prepping making it a great entryway to preventing food waste. Meal Prep Mate is designed to help meal prep novices and experts alike avoid over-purchasing and over-prepping by building personalized shopping lists, portioning out meals, and making use of what’s already in the fridge. Meal Prep Mate offers users a variety of alternative recipes to mix it up, based on the same set of ingredients, to avoid “flavor fatigue” from the same repetitive meal all week long. Check out Meal Prep Mate to learn more about meal prepping, create your own customized meal plan, or choose from an existing meal plan. Along with the Ad Council, NRDC launched the public education campaign Save The Food to help consumers realize the importance of preventing food waste. Because when food goes to waste, so does everything it takes to get that food to our plates: water, energy, fertilizers, cropland and a lot of work. Through Save The Food, we are trying to help consumers overcome some of the barriers we all face in being more efficient with our food purchasing, storing, and cooking because small steps in our daily lives – from the grocery store to the kitchen – can add up to big savings. SaveTheFood.com is full of tips to help us all waste less food and save more money in the process. There you can find Meal Prep Mate, other useful tools, and recipes to help you Save The Food.